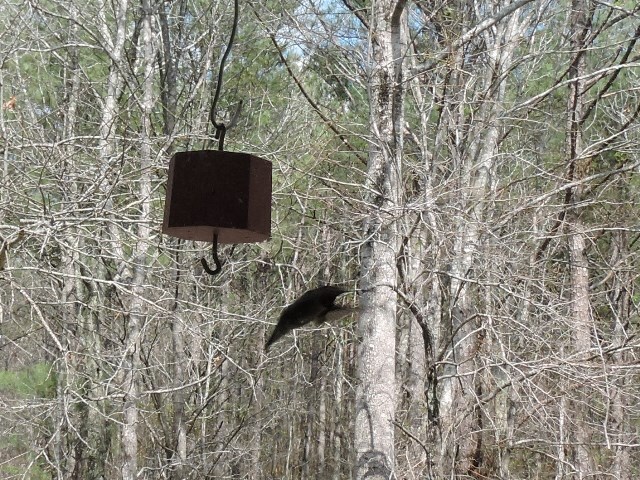 We know it’s spring because we had our first hummingbird at the feeder. Always love it when our hummingbirds return. We had put the first feeder out last week thinking it was about time. Today when we saw the first ruby-throated hummingbird, Max grabbed the feeder to refill it with fresh sugar water. We got one quick picture of the bird impatiently waiting. After Max got the feeder back outside we did not see another bird. 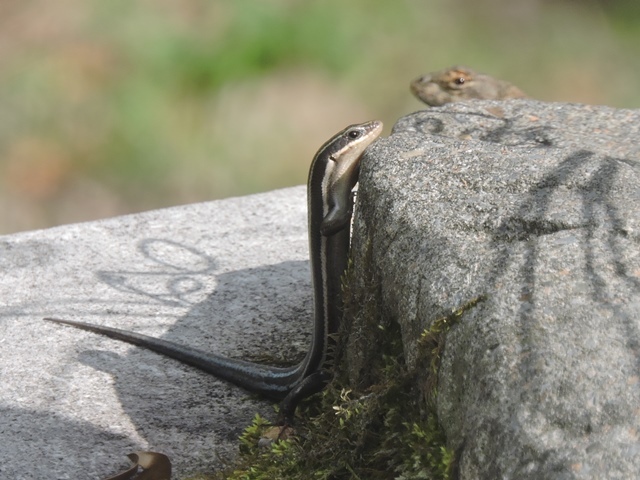 While waiting for the little feller to return we did get to watch a brief encounter between a young blue-tailed skink and an eastern fence lizard. Oh, well – surely the hummingbird will be back tomorrow. We had storms last night! Loud storms with lots of rain. The driveway was a little washed this morning but otherwise, fortunately, no problems. Early morning was still cloudy and dreary but later in the morning the sun was awesome. We started reloading FRED today. We plan to move the rig to Camp Sumatanga Thursday – the weather is suppose to be better than Friday morning. Part of the team will be arriving Friday afternoon so as leaders we must arrive before the team. We are so looking forward to another great project for Sumatanga. It’s going to take a little longer and a lot more trips to get loaded out with Max’s lifting limitations but we should finish up tomorrow. We turned the refrigerator on tonight so we can load it out tomorrow. We are going to be back to work soon! Anne completed Juno’s and Aunt Helen’s tax returns. YEA! We also did some planning for later in the year but we are keeping that a secret for now. Otherwise it was laundry, answering lots of emails, and other mundane stuff. As you remember we had asked one of our team members for an aerial view of the campground at Murphy Harpst Children’s Center and we included that picture in an earlier blog. Today he did even better. Late this afternoon we received a link to a drone video of the campground that our friend Frank Loy made. It’s pretty awesome so be sure to click on the link and take a look. Thanks so much, Frank. We sure have missed being with you guys. Hope everyone gets a good nights rest and check back with us tomorrow. Mike and Ruth, great to hear from you! So glad you guys are back on the road. Safe travels to TN and we are sure you will have a great project. Looking forward to working with you again soon. Previous Previous post: ROAD TRIP!! !